For the fourth year in the row, our local automotive writers’ association has hosted the Rocky Mountain Driving Experience as a chance for local and visiting car guys (and girls) to hot-shoe as many cars as they can handle in a two-day period. This year, we mixed things up between a long ride through the Pine, Deckers and Woodland Park corridor — which spontaneously burst into flames not an hour after we’d been there — as well as a full day on the High Plains Raceway track, about 60 miles east of Denver. The consensus? You absolutely need to go out and buy a Ford Focus ST, a $23,700, bright-yellow screamer that, when driven with some serious intention, did its best to keep up with the $100,000 Nissan GT-R supercar. Like, very impressively. The value-priced Focus gets a rejiggered version of the 2.0-liter EcoBoost turbo that produces 252 horsepower, and with some very aggressive compensation to offset the torque steer, the ST took corners like a bat out of hell. The GT-R was certainly still my overall hot-car-of-the-event winner, though a few of us likened the GT-R’s face-flattening experience (and an extremely brisk ride) to a video game, more than an obscenely fast automobile. GT-R now gets 545 horsepower out of a turbocharged 3.8-liter V6 engine, and with all-wheel drive, it was worth the wait. 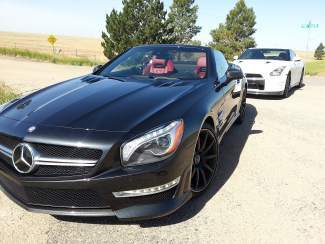 In an even higher and more ridiculously awesome category was the new Mercedes-Benz SL63 AMG, an over-boosted version of the already sadistically quick, high-end two-seater. Our $178,000 model had a performance package pushing the twin-turbo 5.5-liter to a menacing and ugly 564 horsepower; it was actually more fun to drive out on the winding, open road, where you could appreciate its every possible luxury and electronic aid. What was the most fun on the track? A few of us found that to be a toss-up between the wider and more track-oriented Chevy Camaro SS 1LE — featuring a lot of the ZL1 supercar’s upgrades, yet retaining the 426-horsepower 6.2-liter V8, for about $37,000 — and the still-awesome Subaru BRZ, a $26,000 2.0-liter, rear-wheel-drive machine that absolutely lives for the corners. BRZ won’t get you anywhere drag racing, but in the twists, it beat nearly every other car on the track; swinging that fat rear end of the Camaro out on a wide sweeper was worth the price of admission. • True to the ads with fellow Detroit/Ann Arbor native Iggy Pop, designer John Varvatos’s special edition of the 363-horsepower Chrysler 300C is snazzy indeed, with special instrument clusters, a unique clock and unique leather picked out — and limited to 2,000 cars. • The new Chevy Cruze diesel, powered by a 2.0-liter, low-emissions engine, is totally silent, high on the extra torque and got an absolutely solid 43.5 mpg on our highway cruise back home. Equally impressive was the all-new Impala, a big and classy machine I’m hoping to give a full week’s test in the near future. • Kia has stepped up to the luxury plate with the all-new Cadenza, a pleasant executive hauler in the spirit of the Hyundai Genesis sedan, complete with noise-cancelling technology, Nappa leather and 19-inch wheels, all for just over $41,000. • Looking forward to longer trips in both the Honda Accord Sport — a sweetened rendition of the standard Accord, with its own noise-cancelling technology, paddle shifters, twin tailpipes and 278 horsepower — as well as the very impressive new Acura RLX, the company’s new prestige sedan, with 310 horsepower and one of the smoothest rides around. The Accord was the only vehicle whose brakes nearly caught on fire during track time — less likely to occur during your own travels. • The oddballs on the track — but still loads of fun — were the new cabriolet version of the feisty Fiat 500 Abarth, as well as the new NISMO edition of the frog-eyed Nissan Juke micro-crossover. Abarth corners like hell and was tons of fun out running with the big dogs; the Juke sadly did not get the GT-R’s engine (that’s a half-million-dollar special project car) but tried as hard as it could, given its 197 horsepower, and also features some pretty serious race seats.